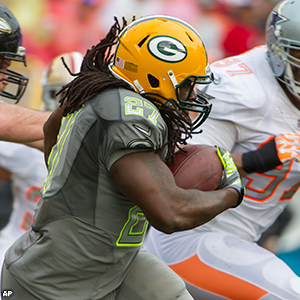 Packers RB Eddie Lacy was named The Associated Press Offensive Rookie of the Year on Saturday. The award was presented to Lacy at the third annual “NFL Honors” show in New York City. Lacy received 35 of the 50 votes. Chargers WR Keenan Allen was second with 12 votes. The remaining three votes were split between Bengals RB Giovani Bernard, Lions T Larry Warford and Vikings WR Cordarrelle Patterson. In a brief phone interview with packers.com after receiving his award, Lacy confessed he was plenty nervous heading up on stage in front of the NFL world and a national TV audience. Lacy joins John Brockington (1971), also a running back with a powerful running style, as the only Packers to win this award. 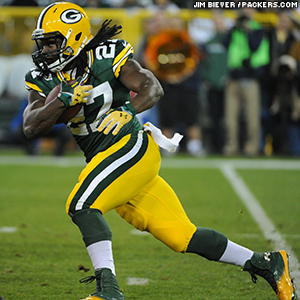 Lacy broke Brockington’s franchise rookie records for carries (284) and rushing yards (1,178) this past season. Lacy said Brockington reached out to him by phone after his 42-year-old records were broken and was more than excited to see where Lacy’s career goes from here. “He’s a great guy and a great man,” Lacy said. “To be able to break his record and have him talk to you about it, it’s a great feeling. I’m just happy to bring that running style back to Green Bay. Lacy also broke Samkon Gado’s franchise rookie record for rushing TDs with 11, nearly doubling Gado’s total of six in 2005. Lacy added 35 receptions for 257 yards in the passing game, giving him over 1,400 yards from scrimmage on the season. Lacy also fumbled just once, in his NFL debut in Week 1 at San Francisco. That was the beginning of a slow start, as Lacy then suffered a concussion on his first carry in Week 2 vs. Washington, which forced him to sit out the rest of that game and the next one, in Week 3 at Cincinnati. Lacy said the only thing he changed about his approach thereafter was to not leave his feet, because he got the concussion by getting hit in the side of the head in midair. He was trying to avoid a teammate on the ground who had tried to throw a block in front of him but ended up paying the price. He went on to rush for 1,127 yards over the final 13 regular-season games, an average of 87 yards per game. The Packers’ lone Pro Bowl representative, Lacy posted four 100-plus-yard rushing games, along with two other games of 90-plus. His season high was 150 yards against Chicago in Week 9 at Lambeau Field, the second-most rushing yards in a single game by a Packers rookie, behind only Gado’s 171 yards against Detroit in Week 14 of 2005. Lacy already had been named Rookie of the Year by the Pro Football Writers of America and a second-team All-Pro by AP. He was the NFL’s Offensive Rookie of the Month for October, joining Gado as the only other Packers rookie to win the monthly honor. He was also named the NFC’s Offensive Player of the Week for his performance at Dallas in Week 15, when he rushed 21 times for 141 yards and a TD, including a 60-yard run on the opening play of the second half to spark Green Bay’s comeback from a 26-3 deficit for a 37-36 win. As for whether his dynamite rookie season and this latest prestigious award put any added pressure on him for 2014, Lacy indicated he’ll be the same laid-back guy off the field and intense competitor on it as his career continues. 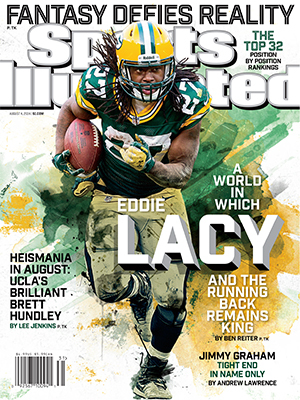 Packers RB Eddie Lacy has been voted by the Pro Football Writers of America as their Rookie of the Year for 2013. Lacy finished the regular season 1,178 rushing yards and 11 TDs, leading all NFL rookies and setting Packers franchise rookie records. Lacy was named the NFL’s Offensive Rookie of the Month for October and was the league’s Offensive Player of the Week after rushing for 141 yards at Dallas in Week 15. He had four 100-yard rushing games, tied for the most among NFL rookies and tied for fifth among all players. His 11 rushing TDs were third overall in the league. Lacy joins teammate Josh Sitton in earning honors this year from the PFWA. Sitton was named to the organization’s All-NFC team.